There have been several questions when it comes with the possibility of doing woodworking without a table saw. We will answer these questions here one by one. Although all the answers for the questions aren’t too difficult to find, we recognize its importance, so we make some effort to provide them here for your convenience. Nevertheless, they are not as complicated as you may think. Let’s get started! 1. Is it possible to have woodworking projects without power tools? 2. Which tool for ripping is good to use in place of table saw? 3. Do I need to resort to power tools just for cross cutting? 4. I have been using table saw for tenons. Is there any other tool that can perform it? 5. Is table saw better than miter saw in performing miter and bevel cuts? Basically, the manual method such as using a handsaw still works depending on how complex the task is. Although power tools have been around for quite some time, there still many woodworkers who prefer to use a handsaw. Actually, using a handsaw is sometimes better because you have full control over the type of task you want to perform. This is why it has never been replaced completely by the latest technology. Keep in mind that historic structures were built without the use of the power tools we know today. Therefore, fine skills are still used like this today. 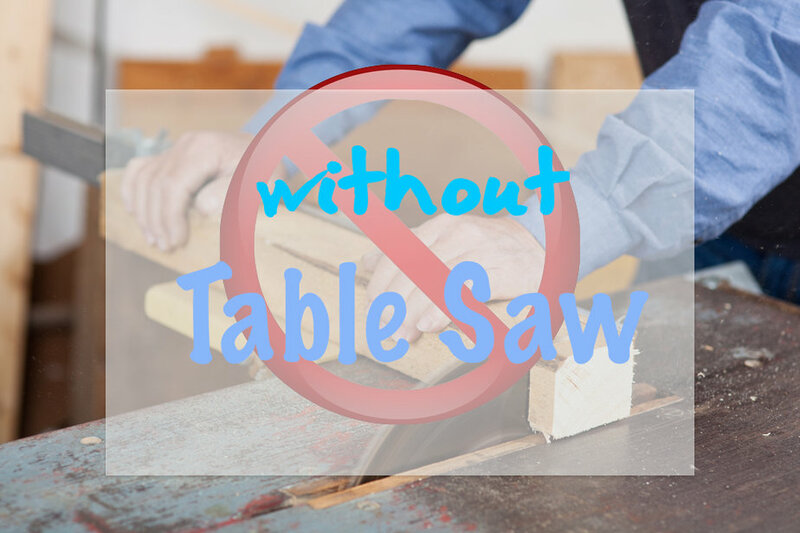 There are many alternative tools that can be used for rips if you don’t have a table saw. One of them is band saw. The advantage of using band saw is that the cutting force is downward, so there is fewer probabilities of seeing flying objects towards you in case the wood pinches the blade. The band saw is safer than a table saw. However, the quality of cut is not as good as that of table saw. But if the rips are to be done on narrower pieces of wood and not on a wide and flat one, even a handsaw is enough to perform it. Whatever tool you use for rips, you will still have to use some manual tools to complete the task such as a chisel in order to clean up the cuts. There are cases that you have don’t have to use power tools for cross cutting. If the wood is small and does not require a finer cut, you can use a handsaw. Table saws are the perfect tool for cross cutting, but you don’t have to resort to it alone in order to have a perfect cut. You can use circular saw for perfect cutting, too. This is actually a tool recommended for wider boards. Nevertheless, it doesn’t necessarily mean that using a handsaw will not produce a finer cut. It depends on your skills. But if you are physically ready to perform a bigger task of cross cutting several big pieces of wood, there is no technical reason not to do it. Remember that all power tools are designed only to lessen the physical task and not to eradicate it. While it is true that not all power tools can perform tenons the way a table saw can, there is still an alternative tool that you can use to perform the same task. The most basic alternative would be the use of a router table. A router table is another smart tool that you can use to perform tasks. Since it can be adjusted to a specific type of cut, it can perform complex cuts such as tenons. Not all router tables are the same. They vary in functions and features. If you want to use a router table instead of table saw to make tenons, you will need to apply a little art and creativity to use it. The answer is no. The miter saw is better than the table saw when it comes to miter and bevel. This is because miter saw is specifically designed to perform the said cuts. Furthermore, it has several features to make the result more accurate and finer. Since miter is an angled cross cut, it must be done in a specific angle that matches the other portion of wood. With a miter saw, you can set a specific angle such as 45 degrees with speed and accuracy. It means cutting a piece of wood in perfect angle can be done much easier using miter saw. Nevertheless, miter and bevel can also be done using a handsaw. Just don’t forget that woodworking projects without power tools are always possible. The answer to all the questions shows that there are many ways to become a better woodworker and alternatives to continue your task of doing woodworking without a table saw. Although the above questions seem to be complicated, the answers are simple and straightforward. All in all, table saw is not the only tool to depend on, and even a manual method like handsaw can also be an alternative tool to answer the above concerns. It is not the tool that matters but your creativity. Should you have more questions, feel free to inform us, and we will answer them accordingly.